Read more about Dr. Jeremy Palmer at http://www.chee.uh.edu/faculty/palmer. Understanding particle transport through soft, disordered media is relevant to applications ranging from medical imaging and drug delivery to enhanced oil recovery and polymer nanocomposite processing. When particle size is comparable to typical length scales within the confining medium, transport processes are well described by continuum theories. The continuum assumption breaks down, however, when particles and features of the medium are comparable in size. In this limit, particle transport remains incompletely understood. In my talk, I will discuss our recent application of molecular simulation to investigate particle transport through two types of complex soft materials. First, I will demonstrate that advanced simulation techniques can be used to elucidate the physical mechanisms responsible for the anomalous transport behavior that has been recently reported in microscopy experiments on nanoparticles suspending in semi-dilute polymer solutions. Second, I will show how dynamical trajectories of embedded tracer particles can be analyzed to gain insight into the morphology of the slow and collective structural rearrangements that facilitate relaxation in supercooled liquids and glasses. In both systems, unusual dynamics arise due to the coupling of particle motions with comparably sized fluctuations in the surrounding medium. 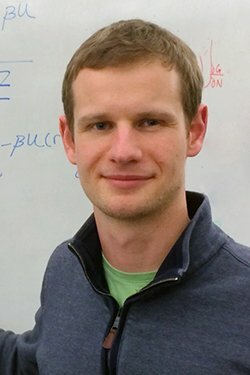 Jeremy Palmer is a computational scientist studying supercooled liquids and glasses, crystallization phenomena, and adsorption and transport in complex media. He received a BS in biomedical engineering from Johns Hopkins University (2006) and PhD (2011) in chemical engineering from North Carolina State University, and worked as a postdoc in chemical engineering at Princeton University from 2011—2014. In 2014, he joined UH as an Assistant Professor of Chemical and Biomolecular Engineering. He is the recipient of the Regional Blavatnik Award for Young Scientists (in Chemistry, 2014) and the NSF CAREER Award (2018).